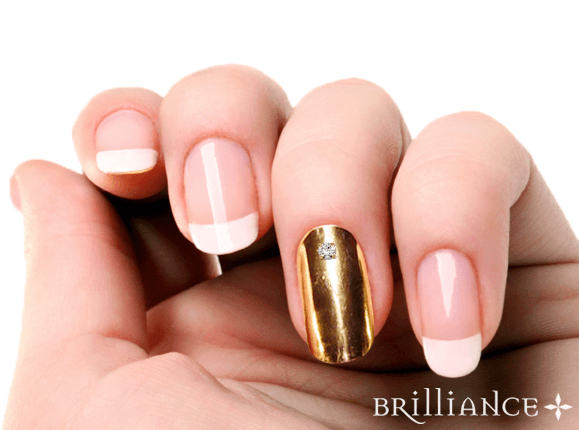 Nail art is one of the hottest ways to show your personal style, and Brilliance.com has a new way to make your fingertips sparkle! Our nails attach to your real nails and take the latest trend of high-shine, mirror-like polish a step further. Made of real precious metals like white gold, palladium (hypoallergenic for those with allergies), silver, and yellow gold, our nails put a classy twist on a trendy style. Customize your nails by adding diamonds or gemstones in a pattern of your choice for some added bling. A single diamond at the tip of the nail is a nouveau classic, while a line of three diamonds up the middle of your nail elongates your finger. Prefer a pop of color? Consider dotting the tip of your nail with a short row of gemstones, like sapphires or rubies, to really make them stand out. Buy a single nail to decorate a “feature finger,” or glam it up by decking out all your digits with your favorite metal/gemstone combo. Whatever style you choose, you’ll be the trendsetter at your next event! We stand behind all our products and offer a lifetime warranty on all our work. Pricing is available upon request. Interested in having your nails blinged out by Brilliance.com? Phone us! Contact our diamond and jewelry experts at 866-737-0754 and start your custom jewelry item today.